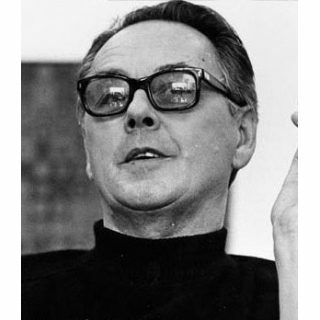 Victor Vasarely is internationally recognized as one of the most important artists of the 20th century. Being an acknowledge leader of the Op Art movement, his innovations with color and optical illusions ahve had a significant influence on many modern artsits today. It wasn't until 1947 when Vasarely discovered his place in abstract art. He was at Breton Beach of Belle Isle when inspiration struck him. He then conceived that form and color are inseparable. He was then able to transport nature into truly abstracted elements in his paintings. Vasarely wrote, "the ellipsoid form... will slowly, but tenaciously, take hold of the surface, and become its raison d'etre. Henceforth, this ovoid form will signify in all my works of this period, the 'oceanic feeling'.. I can no longer admit an inner world and another, an outer world, apart. The within and the without communicate by osmosis, or, one might rather say: the spatial-material universe, energetic-living, feeling-thinking, from a whole, indivisible... The languages of the spirit are but the supervibrations of the great physical nature." 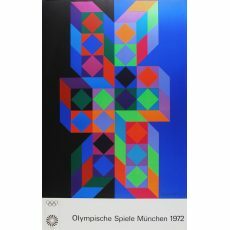 Born in Pecs, Hunary, Vasarely would go on to receive a bachelors degree in 1925 he began studying art at the Podolini-Volkmann Academy in Budapest. He transfered to the Muhely Academy in 1928 where he studied with Alexander Bortnijik. He also became familiar with the contemporary researcfh in color and optics by Jaohannes Itten, Josef Albers, and the Constructivists Malevich and Kandinsky. Vasarely began to work with oils in 1943 and created both abstract and figurative images. His first Parisian exhibition was the following year at the Galerie Denise REne which he had helped found. He begane recognized as a leader of the avant-garde group of artists affiliated with the gallery. In 1955 Galerie Denise Rene hosted a major group exhibition in connection with Vasarely's painting experiments with movement. This was the first important exhibition of kinetic art and inclluded works by Yaacov Agam, Pol Bury, Soto, and Jean Tinguely, among others.